Being homeless takes a big toll on kids in the classroom. Today, more than 1.3 million children and youth across the country fit that legal definition, the majority of them staying temporarily with friends or family. A little-known federal law — the McKinney Vento Homeless Assistance Act — is tailored to helping those kids succeed, and this year its provisions got even stronger. Yet the law has been chronically underfunded for decades. 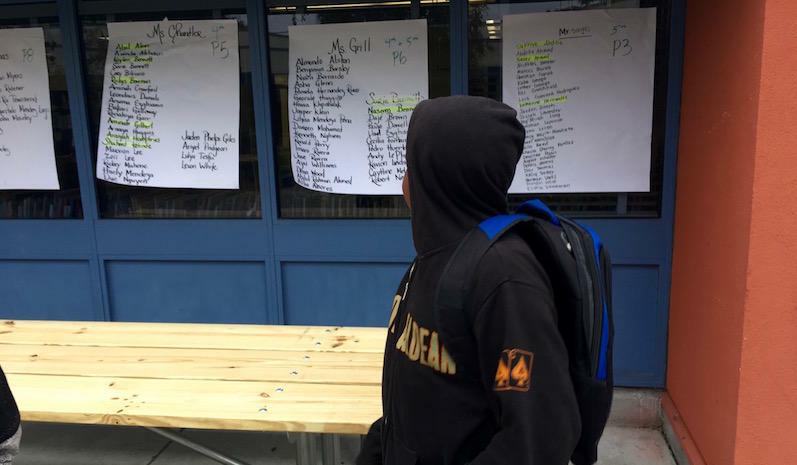 Oakland Unified School District is no exception, even though a red-hot housing market contributed to a huge boost in homeless students last year. Naseem Bennett is getting ready for his first day of fifth grade. He can’t find his bubblegum toothpaste, so he has to use the adult stuff. He swirls his toothbrush in the clogged bathroom sink to take the edge off. It doesn’t help much. It sounds like a typical domestic scene, but this isn’t Naseem’s home. He and his mom, Rachael Allamby, 41, sleep in his great-grandmother’s living room. By 6 a.m., Naseem’s red air mattress is propped against the wall. The couch where his mother sleeps is tidied. And all their bedding and other belongings are tucked in a tight heap in the corner, under a blanket. For years, Naseem lived in North Oakland with his mother, his two sisters, and the family cat and chihuahua. Then, last fall, they got evicted from their duplex. Allamby says it was a wrongful conviction, that she always paid her rent on time, but that when she was late coming up with some money for repairs, the landlord booted her. They became homeless — a word that's hard for her to use. She and her son had no other choice but to come to this small, one-bedroom apartment near a leafy park in South San Francisco. Naseem’s great-grandmother is sleeping with her door propped open. He and his mom try not to wake her. “Naseem is the main one I worry about, because I know when he’s stressed out, “ Allamby says in a whisper. He’s had anxiety attacks, temper tantrums, lots of stress eating, “and then traveling from here all the way to Oakland” and back again, Allamby adds. All that travel? That’s so Naseem can stay in the same school where he’s been since kindergarten. Where they know him, and care about him. Plenty of research shows that students who lose their housing, even briefly, perform more poorly in school. They’re often late or miss days. They’re less likely than any other group to graduate. Maintaining stability at school after a child loses his or her home, it turns out, can be key to educational success. But it makes for long days for Naseem. His school is 22 miles and three counties away. Naseem stuffs a bag of dum dums in his pocket and scrounges for his Pokémon cards, a recent gift. By 6:30 am, Allamby announces it’s time to hit the road. Naseem responds with a loud sigh that borders on a groan. Rachael Allamby and her son, Naseem, 10, start their nearly two-hour commute from South San Francisco to his Oakland elementary school. They lost their Oakland housing last year and are staying here, with Naseem’s great-grandmother. Maintaining some school stability for Naseem is Allamby’s priority. It’s also her right under a federal law that offers protections to homeless students. He grabs a black zip-up hoodie and fetches what he calls his “car,” a scooter with beat up handlebars and busted front brakes. 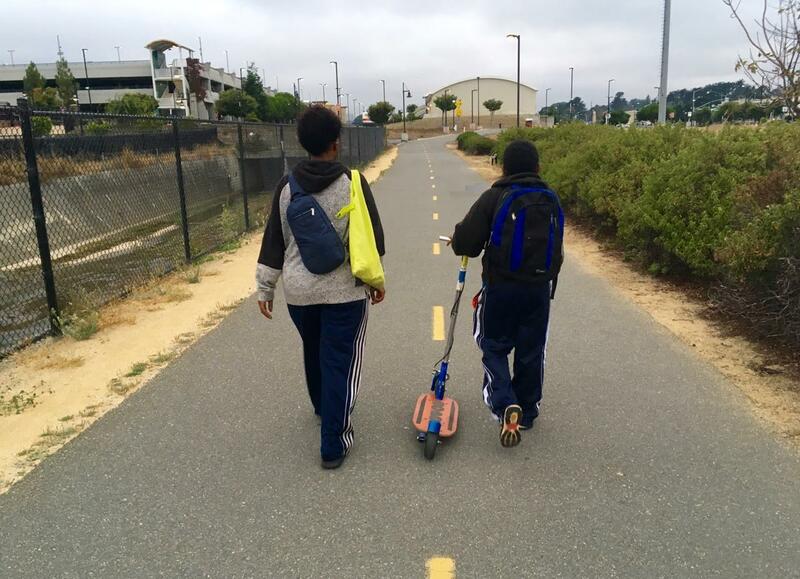 The BART station is more than a mile away — and the whole trip to Naseem’s Oakland school will take nearly two hours — so the scooter helps. Allamby and Naseem take a jogger’s path to the station, teasing and goofing along the way. Mom tosses out the first joke. “What’s the name of the vegetable kung fu master?” she asks. Naseem’s right on it with the answer: “Brock Lee,” he squeals. Allamby knows how to prioritize her kids’ education. Her eldest daughter just started at UC Berkeley. She’s got big hopes for Naseem, too, which is why she really wants him to maintain some continuity at school. 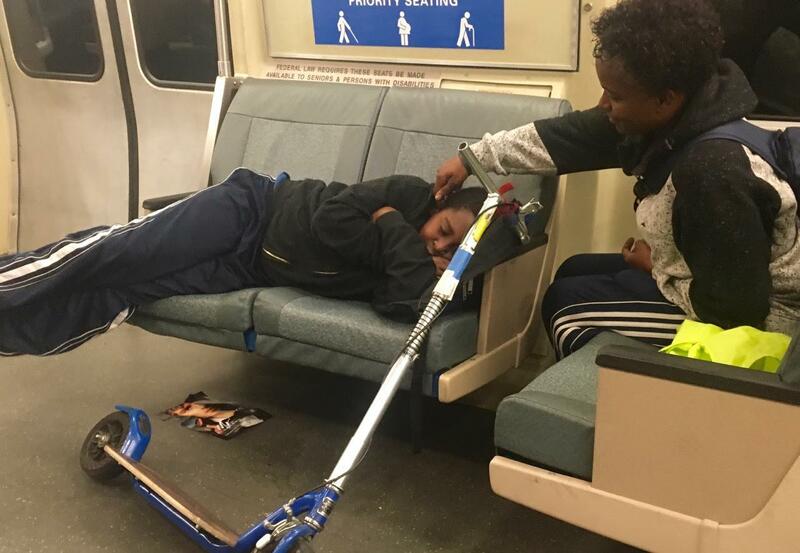 Rachael Allamby and her son, Naseem, 10, spend nearly two hours getting to his Oakland elementary school, much of it on BART. The fares cost her nearly $400 a month. Keeping Naseem in the same school? It turns out that’s actually Allamby’s legal right. Three decades ago, President Ronald Reagan signed the McKinney Vento Homeless Assistance Act into federal law. The big-picture idea: to provide stability. The law guarantees that kids who have lost their fixed housing can stay at the school they’ve been attending. It guarantees other rights too — like the right to enroll immediately at a new school without proof of residence or immunization. Perhaps most critically for many parents who wish to keep kids in their original school, the act in most circumstances pledges help with transportation costs to get there and back. Allamby and Naseem could really use that. When they get to BART, it’s time for an uncomfortable ritual. Allamby has scrounged up two BART tickets. But the combined value isn’t enough. She needs Naseem to run through the emergency gate -- again. She knows she keeps saying it’s the last time, she tells him. Naseem listens. “But it’s never the last time,” he points out quietly. The BART fares alone run Allamby about $400 per month, so it’s a problem. Naseem makes it through without getting stopped, and when he and his mom arrive at Oakland’s MacArthur station, Allamby explains to the station agents that they are just a bit short. They let mother and son exit. These two know her, Allamby says. They saw her bring Naseem to school a lot before summer break. Naseem’s situation is not unusual. In the 2016-17 school year, the Oakland Unified School District saw an increase of more than 50 percent in its homeless student tally. That's almost 1600 kids, according to the district’s McKinney Vento office. And those are just the families the district knows about. 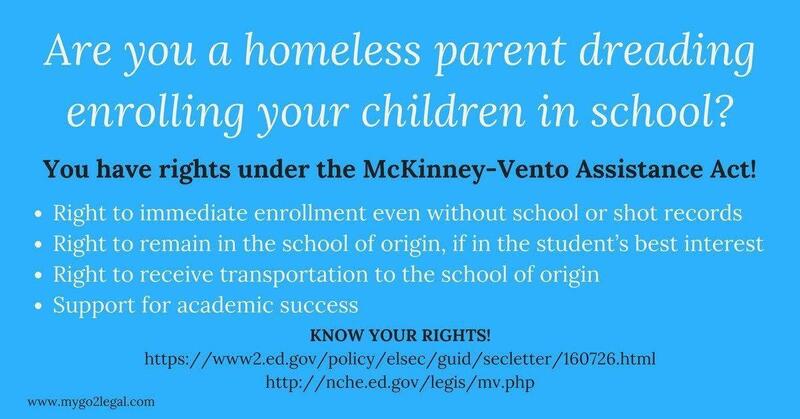 The Mckinney Vento Homeless Assistance Act, signed into law three decades ago and recently strengthened, offers rights and services to homeless students. School districts are supposed to publicize the law so parents and unaccompanied youth will overcome fear and admit their circumstances. Yet the law has been chronically underfunded, and many districts do not fully comply. Trish Anderson is the district’s new McKinney Vento liaison. She took over this fall. Oakland, she says, is full of families who’ve been pushed out of stable housing. Many are invisible, doubled up like Naseem is with relatives or friends. Others are living in cars, shelters or motels. “When you think about the number of people in that situation in Oakland right now with the housing crisis, that number is bound to be larger than it was in the past,” Anderson says in an interview. McKinney Vento mandates that districts work with schools to identify students who’ve lost their housing. District liaisons are also supposed to spread the word at soup kitchens, shelters, motels and laundromats — so that families know that they're entitled to stay in their home school, enroll without proof of an address, get transportation help, access support for school supplies and clothes, and referrals to dental care, housing and other services. But there’s a big gap between what the law promises and what it delivers. Anderson is just one person, with a colossal caseload of 1,600. The district’s funding for homeless students? It’s stayed flat for the past three school years, at $230,885, and isn’t projected to grow this year either. The California Department of Education doles out federal McKinney Vento grants to districts to help them comply with the law — but there isn’t enough to go around, and the three-year grants are competitive: Fewer than half of the 131 districts that applied in the most recent cycle, in 2015, received one. Oakland Unified wasn’t among them. In fact, it hasn’t received any federal grant money through the state since 2011. Even though California has more homeless students than any other state, the state has just one McKinney Vento coordinator to ensure that 1,800 districts, county educational offices, and privately-funded charter schools are complying with the law. This year, changes to the law require that state liaison to step up training for district liaisons such as Anderson. And Anderson, in turn, is now required to do more to make sure Oakland school personnel — principals on down — get trained in the law too. Meanwhile, every single school district in the country is now mandated to publicly report achievement, suspension and graduation rates for homeless students, to shine a brighter light out how they’re doing and whether they’re getting the support they need. But right now, plenty fall through the cracks. Naseem and his mom arrive at Emerson Elementary School, in Oakland’s Temescal district, not long before the 8:30 a.m. bell. “Hi Miss Brook!” he yells as he waits for his mom to fill out forms. Allamby recently scored a full-time job as a janitor in San Francisco, so she wasn’t able to register him on time. She catches up now. 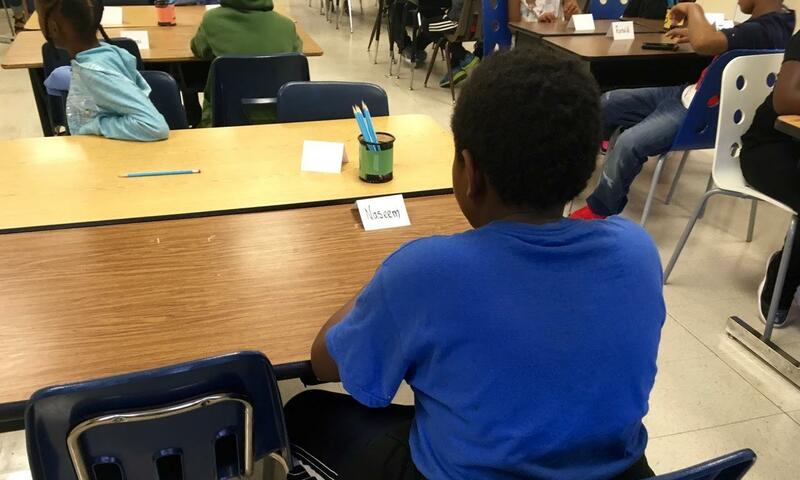 Naseem Bennett, 10, sits in his classroom at Emerson Elementary School on the first day of fifth grade. He’s been in good spirits all morning but his mood shifts once school starts. Some of the staff here know Naseem’s situation. They figured it out last year when he started showing up late. They offered him counseling, and a coach brought Naseem clothes and a new Xbox, since he lost a lot of stuff in the eviction. Principal Heather Palin says a team that includes teachers and counselors know how to spot the signs that a student might have lost his or her housing. But even community schools like Emerson, which make a holistic effort to help kids and families, many employees aren’t that familiar with the McKinney Vento law. Palin’s not sure whether the information on a student’s housing status gets back to the district’s McKinney Vento office. “I wouldn’t say necessarily that there’s a lot of training” in the law, she says. That’s a problem. Palin couldn’t talk about the specifics of Naseem’s case, for privacy reasons. But it turns out, he wasn’t included in the district’s homeless student tally last year. Cases like this mean that Oakland’s numbers aren’t accurate, which can affect funding. More importantly, it means no one really spelled out for Allamby her rights under federal law or the services that the district can provide. On top of that, it’s not uncommon for parents and youth to hide their circumstances, due to embarrassment. And because they don’t fully understand their rights, they’re fearful, too, that their kids might be told that they can’t stay in their schools. Naseem’s been in high spirits all morning. But his mood starts to shift when it’s time to file into his classroom. Inside, he turns down the apple and yogurt that his teacher, Miss Grill, offers to all students as part of Emerson’s recent breakfast-for-all initiative. Then he puts his head on his desk. Naseem says he’s hungry. So Miss Grill reaches into her personal snack bag and gives him a banana. Parents and youth who have lost their fixed housing are sometimes identified during Oakland Unified’s centralized enrollment process, when they can’t come up with proof of a current address — or if they check a small box on the registration form that asks whether they are homeless or doubled up. They’re then told to drop by the district’s Transitional Students & Families Unit. Trish Anderson says that during the first week of school the drop-in center was packed. She fixed it up with a donated sofa and comfortable chairs, decorated the walls, and got to work writing letters to tap the private and nonprofit sectors for help. Anderson is hoping to team up with My New Red Shoes, a nonprofit organization, to secure shoes for kids and possibly gift cards, too, that families can use to buy school uniforms and other back-to-school clothing. Feed the Children and Kingergarten to College provide her office with backpacks and school supplies. Anderson is pitching a host of other area businesses now, too. For many districts, that community help is the best hope to comply with the McKinney Vento law, which is clear about transit help. If a parent chooses to keep their child in the school of origin, Oakland Unified, under nearly all circumstances must pay for transit. If the student is temporarily residing within another district’s boundaries, the two districts are supposed to share the cost. But Oakland Unified doesn’t offer BART cards, Anderson said. And so it doesn’t coordinate with districts outside Alameda County to help get kids to school here. It turns out, other than salaries and overhead, Oakland Unified's entire budget for homeless students goes toward AC Transit bus passes. And it falls short. She arranged to have some passes dropped off at Emerson for Naseem and his mom, since Allamby can’t easily get to the drop-in center. It’s all she can offer. Allamby is grateful. But the bus system only covers western Alameda and Contra Costa counties. As for her main commute costs, on BART, she’s out of luck. By the time she and Naseem get back to South San Francisco, it’s almost 8 p.m. They’ve been out of the house for more than 13 hours. They’re exhausted. Rachael worries that her son is not getting enough sleep to focus in school or on homework. And there’s trauma that’s harder to see. Allamby loves to dream about the home she’ll share with Naseem again one day. But he doesn’t seem to want to play that game. Asked what he misses about Oakland, he breathes heavily. He pauses. He sighs. He doesn’t answer. His mom thinks he just can’t go there right now, that he’s not confident he’ll ever have his own space again.